The team will represent New York State at the National Finals in Washington, D.C. The Half Hollow Hills High School East’s We The People team. 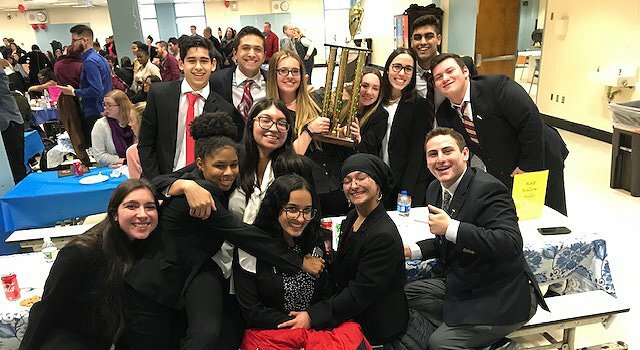 Dix Hills, NY - January 23, 2019 - The Half Hollow Hills High School East’s We The People team won their second consecutive New York State championship on January 12, 2019, at Martin Luther King Jr. High School in New York City. The team will represent New York State at the National Finals on April 26-29, 2019, in Washington, D.C., and will compete against approximately 1,200 students from 56 high school classes in simulated congressional hearings. During a We The People competition, students demonstrate their knowledge and understanding of constitutional principles and have opportunities to evaluate, take, and defend positions on relevant historical and contemporary issues. They participate in simulated congressional hearings and “testify” before a panel of judges acting as members of Congress. The New York State competition was sponsored by the Justice Resource Center, and featured nine other very competitive programs from New York City and upstate New York. The competition covers a wide range of topics from over six units, each relating to an aspect of the curriculum from their government classes. Questions this year ranged from ‘what responsibility, if any, do younger voters have to better understand government and the Constitution and Bill of Rights’, to ‘should non-citizens be allowed to vote in local elections’? "I am so proud of our team for winning the New York State Competition for the second year in a row,” said David Pitman, AP Government teacher at High School East and coach for the We The People program. “Being a part of a program like this and watching young people engage in civic education and civil discourse is an important and refreshing reminder of who we as a nation can be." The National Competition is hosted by the Center for Civic Education. The Center for Civic Education is a nonprofit, nonpartisan education organization that administers national and international civic education programs. The Center’s flagship civic education program, We the People: The Citizen and the Constitution, was developed in 1987 and adopted by the Commission on the Bicentennial of the U.S. Constitution, chaired by Chief Justice Warren E. Burger, as the principal education program of the federal Constitution’s bicentennial. An education-oriented community with high academic expectations, the Half Hollow Hills Central School District is located in a residential area of 50,000 people in the central part of Long Island, approximately 40 miles from New York City. Providing for the education of almost 8,000 students, the school district has five elementary schools, two middle schools and two high schools. Half Hollow Hills High Schools are fully accredited by the New York State Department of Education. The district is committed to providing all students with opportunities to excel in academics, athletics and the arts. Subject: LongIsland.com - Your Name sent you Article details of "Half Hollow Hills "We The People" Team Wins Second Consecutive New York State Championship"